I’ve fallen back in love with Kidsilk Haze. I’ve had an off / on relationship with this blend of silk and mohair for years. I go through phases, I love it’s softness, But my sensitive skin occasionally complains it’s too fuzzy. So,I had to try this new addition to the Rowan range. The yarn is exceptionally soft, fluffy and warm. I spent hours swatching and trying out the yarn with different sizes of hook and needles. eventually I came up with this simple design which I think does the color changes justice – and is much quicker to knit up than the free scarf pattern on the ball band. I think it strikes just the right note between fun and sophistication. From start to finish it took me 2 afternoons, suitable for a beginner you could easily make it in a weekend. 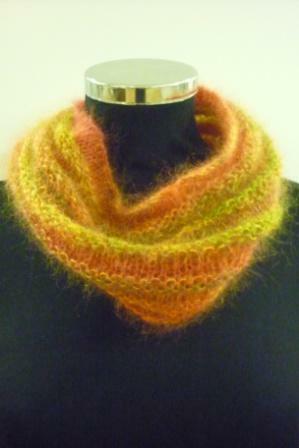 In fact, it’s the ideal project for a new knitter or the perfect telly project! I wore it all day to work on Thursday, with no sensitivity to the fibres and so I’m back in love with Kidsilk Haze. 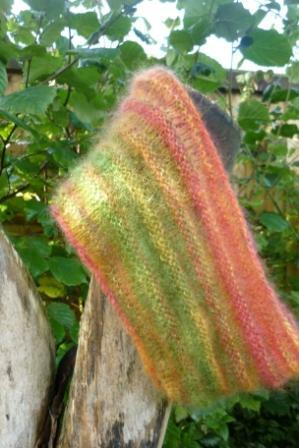 Fortunately I have plenty in my stash and so a pair of long, fingerless gloves are on the needles as I write! OOOh Tracey…..your cowls do look so soft and silky. The colours are beautiful so autumnal! Really cool pattern too – there’s no end to your talents!